Northern Joinery Ltd is a privately owned company specialising in the design and manufacture of quality timber staircases. Founded in 1958 we have a wealth of unrivalled experience in the manufacture of staircases for National and Regional House Builders and individual customers who seek bespoke staircase designs. Every staircase is custom made from softwood or hardwood and can be factory pre-finished to the highest standard. 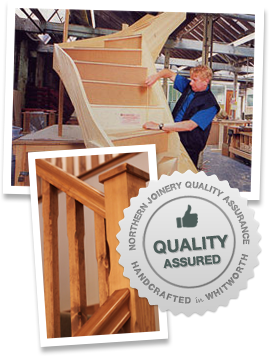 Northern Joinery is one of the leading quality staircase manufacturers within the UK having pioneered many of the common practices used in the production of staircases today. Over the years we have invested heavily in state of the art, precision machinery dedicated to the machining of quality staircase components. Northern Joinery boasts one of the best staircase-manufacturing plants in the UK with a capacity well in excess of 200 bespoke staircases per week. The design and manufacture of staircases is carried out in house from our factory in Whitworth, Lancashire, close to the M62 motorway. We deliver our custom made staircases accross the country in our fleet of rigid box vehicles to ensure and guarantee safe on time deliveries to all parts of the UK. 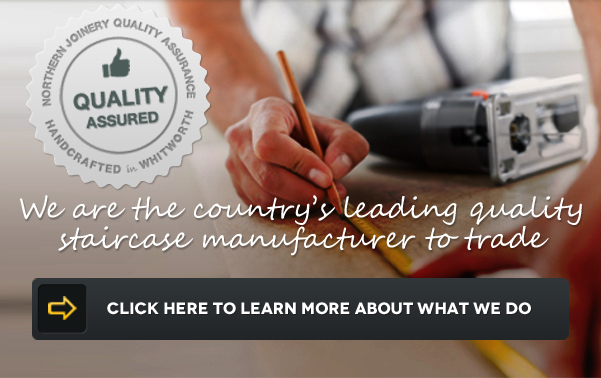 At Northern Joinery we are committed to quality products and quality service for all our customers. We utilise cost effective materials and production methods embracing renewable resources without compromising on quality and are accredited to the PEFC Chain of Custody standard. We have a team of skilful designers each with designated regions to ensure each customer receives individual service with a single point of contact. This team is supported by the skills and experience of our time served joiners, staircase technicians and site surveyors. Northern Joinery was the first timber staircase manufacturer to obtain Certification to BS5750 1987 Part 2 in August 1989, the coveted Quality Management Standard now ISO9001:2008. We are a founder member of the Timber Staircase Association and accredited members of the British Woodworking Federation Stair Scheme. Our proactive approach illustrates our continued commitment to provide customers with compliant staircases and unrivalled quality and service. 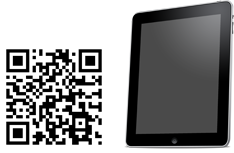 Try out our 3D designer tool which allows you to design & view a 3D image of the staircase quickly and simply. Northern Joinery Ltd was the first staircase specialist in the country to obtain registration to BS5750: 1987 Part 2 in August 1989. Since then we have continued to develop our Quality Management System exceeding the current requirements for ISO 9001:2008. We have an ongoing relationship with our local technical college and are committed to upskilling our workforce throughout the company.